ROCKLAND, Maine (AP) — Pop artist Robert Indiana died in a house with a hole in the roof and pigeons living inside. The front windows are now boarded up. Buckets collect water. Clapboards are peeling. 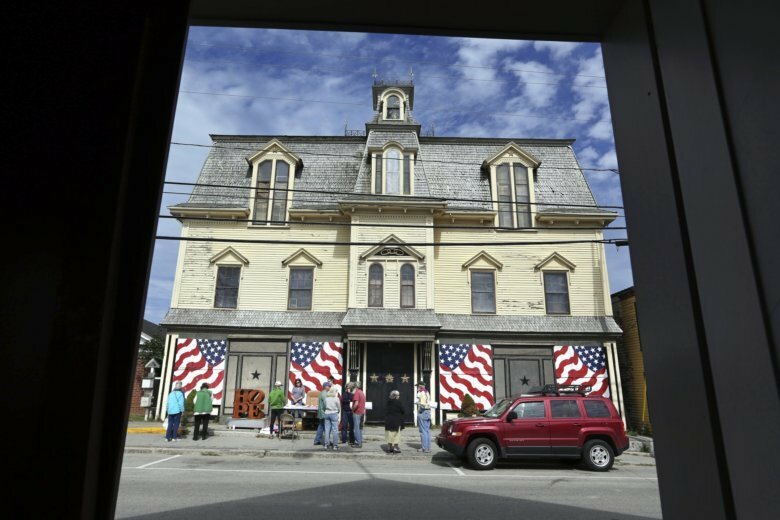 The degraded condition of the Victorian, dubbed the Star of Hope, means millions of dollars will have to be spent to fulfill Indiana’s vision of transforming the mansion into a museum, where his artwork would be preserved and displayed on Vinalhaven Island. Local residents fear the home’s condition could be beyond hope by the time his estate is settled. “I don’t think it would take much longer for it to be beyond repair,” said Phil Crossman, chairman of Historic Down Street LLC, which was formed to protect historical properties. Built in the 1870s, the 12-room building in Main Street on the island 15 miles from the mainland was a gathering place for a chapter of the Independent Order of Odd Fellows, an international fraternal organization. It’s on the National Register of Historic Places. Indiana retreated there in 1978 after turning his back on New York City, where he lived when he created his LOVE series. He died at the home on May 19 at age 89. Based on the home’s condition, it’d be easy to conclude that Indiana was poor. But testimony in a probate court hearing this month showed he was spending hundreds of thousands of dollars in his final years even as basic maintenance was neglected. Testimony during a probate court hearing showed that his total estate, including his iconic LOVE series of artwork, is valued at more than $60 million. “By no means was he destitute,” said James Brannan, who was Indiana’s attorney and now represents his estate. On Vinalhaven, people are bewildered by the condition of the building. Rotting exterior clapboards and sheathing are in such rough shape that they wouldn’t support a handyman’s ladder, Crossman said. Plywood had to be placed over the windows when the glass started falling out. A blue tarp covers the hole in the roof. The irony is that the home meant the world to Indiana. Indiana, who was born Robert Clark in New Castle, Indiana, never set down roots as a kid. His parents divorced when he was young, and he moved frequently. It wasn’t until he moved to Vinalhaven that he settled down in one place — for four decades, it turned out. The Star of Hope served as both his home and art studio. Over the years, Indiana always made it clear that the Star of Hope should be preserved even when he was considering different options for displaying his artwork, said Michael Komanecky, chief curator of the Farnsworth Art Museum in Rockland. Many outsiders were critical of the man who served as Indiana’s caretaker and power of attorney for declining to do anything about the deteriorating condition. Brannan said that’s probably not fair. Indiana, after all, was notoriously reclusive and known for turning away visitors, including Brannan himself. “Bob didn’t like people coming into his home. And it’s not unusual for elderly people to become reclusive and not want visitors to see how they’re living,” he said. It could take several years for Indiana’s estate to be settled, and locals want steps to be taken in the interim to stop the deterioration from accelerating. Brannan said he’d like to see the home stabilized, but he wants to be frugal because the entire structure will eventually be gutted. The cost of transforming the building into a museum will likely cost upward of $10 million, and the estate doesn’t have that money, Brannan said. Most of the estate’s value comes from Indiana’s artwork, and the estate wants to keep and protect the artwork, not sell it, Brannan said. Besides, flooding the art market with Indiana’s works to raise capital could depress their value. Crossman, for his part, hopes the parties involved in a lawsuit over his assets exercise “common sense” and protect the home before the Star of Hope is beyond repair. This story has been corrected to show Indiana lived in New York when he created his LOVE series, not his HOPE series.